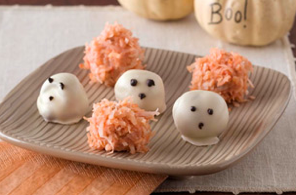 These adorable little truffles are dead easy and look absolutely delicious! Adults and kids alike will love how cute they are and their small sizes are perfect for children’s Halloween parties. To make the pumpkins more pumpkin-like, stick a halved pecan on top of the orange truffles for the stem, and add a sprig of mint for a leaf. Do you plan to throw a Halloween party? Serving these little babies is guaranteed to make it a hit and you can visit one of our Halloween stores to make your house party-ready as well! Each store carries tons of props and decorations (and don’t forget your Halloween costume, either!) so that your home can be festive and fun. MICROWAVE bittersweet chocolate squares, cream and butter in microwaveable bowl on HIGH 1-1/2 to 2 min., stirring after 1 min. Stir until chocolate is completely melted; cover. Freeze 1 hour or until firm enough to handle. Use teaspoon to scoop and roll chocolate mixture into 20 balls, each about 1 inch in diameter; place on waxed paper-covered baking sheet. Freeze 20 min. MICROWAVE 3 white chocolate squares in clean microwaveable 1-cup measuring cup or small bowl 1 to 1-1/2 min., stirring after 1 min. Stir until chocolate is completely melted. Set aside. Repeat with remaining white chocolate squares in separate cup or bowl; stir in food colourings. Cool chocolates completely. Place coconut in resealable plastic bag; seal bag. Add 1 to 2 drops each of red and yellow food colouring; close bag and shake until coconut is evenly tinted. Use a toothpick to dip the truffle into melted white chocolate; shake off excess chocolate then place truffle on waxed paper. This may leave just a small hole on top that can be covered with a tiny dab of chocolate. Easy, right? These yummy looking truffles will be ready in no time! Will you give them a try? Let us know! Yum! Definitely going to give these a try. Thanks!